Bangers and Mash, lovely, eh? Great, steaming plates of the stuff... just a bit of mustard and salt and pepper and... wait a minute, how can you make a game out of a plate of nosh? Well you can't, really. 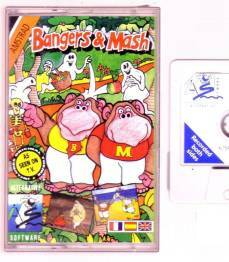 Not unless you first of all invent a cartoon TV series about a couple of chimps who just happen to be called Bangers and Mash. Then you make a game out of it, see? 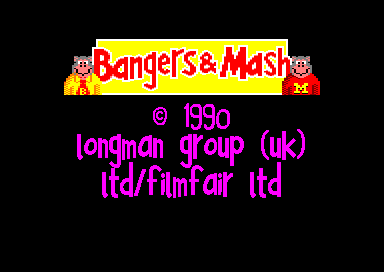 Bangers and Mash are mischievous little monkeys. They play their old mum up a bit and are always getting into trouble. Until one day, mum gets a bit fed up and sends them both out to collect fruit for a giant fruit pie. Wait a minute. If there are two chimps, how come you only control one of them in the game? 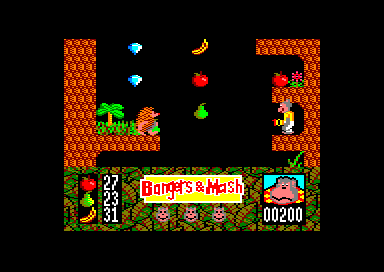 Bangers is the one who does all the fruit-stalking, while Mash is nowhere to be seen. According to our notes, here, Mash is way up in the trees making giant mud pies to flatten the various nasties inhabiting the forest. Bit naff, we say. Bangers can fling a few mud pies himself, mind - at the rate of around 120 a minute, in fact. These mud pies must have a few rocks accidentally mixed in, because they do a good job of wiping out the cuddly (but lethal) hedgehogs and cute ladybirds that prowl around the vegetation. Even worse are the ghosts that occasionally put in an appearance. You can't kill them, but you can make them go away by throwing enough pies. Look out too for Mrs Snitchnose, who flies around on her broomstick generally making a nuisance of herself. Your aim is to climb right to jhe top of the forest, collecting every single fruit along the way. If you don't collect all the fruit you can't move on to the next level! Which is a bit of a pain in the neck, really, considering that you have to enter a graveyard at one point to collect more fruit - and jump down a hollow tree trunk later on. If do eventually make it to the top with all the fruit, though, a balloon comes down and transports you to the next level. How , exciting! Or is it? The next (and final) level is in the jungle again. There are no sub-levels (like graveyards or holly low tree trunks) this time, but the baddies are tougher and the jumps harder to make. 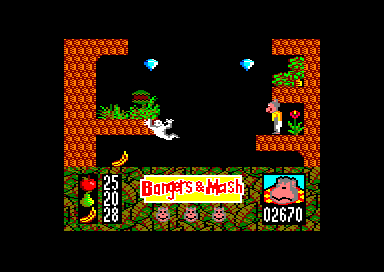 Bangers and Mash is jolly enough in a kiddies kind of way, but if's a bit flawed. It's very tough, for a start. And there really isn't a lot of variety. And the graphics, while colourful, and blocky and not very well animated. There's a fairly big game task, though, despite the fact there are only two levels.